Super Typhoon Chan-hom: China prepares as Shanghai faces record storm surge flooding. 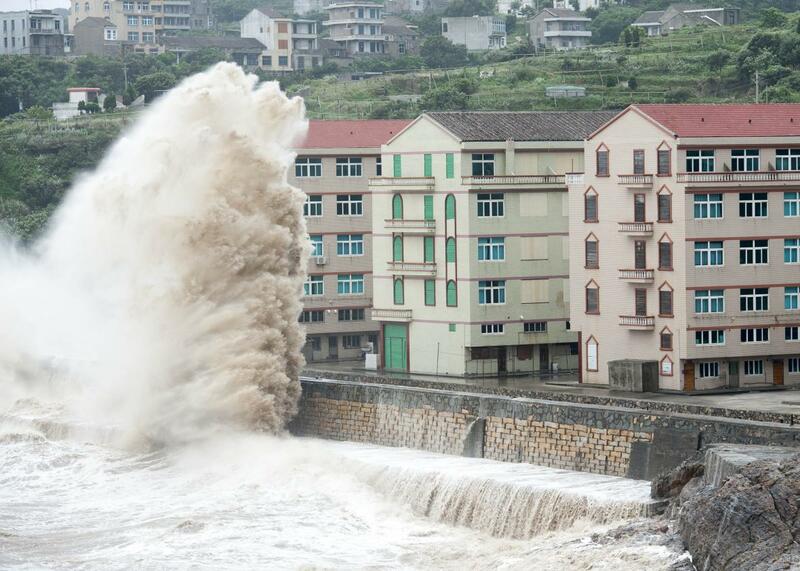 Huge waves from Typhoon Chan-hom are seen in Wenling, China, on Friday. Chan-hom should make its closest approach to Shanghai, China’s biggest city, on Saturday. China’s Xinhua state news agency reports the country was on its “highest alert” as Typhoon Chan-hom approached Shanghai, its largest city, on Friday. Coastal flooding is the biggest risk: Think New York City during Hurricane Sandy. If you’re in Shanghai, now’s a good time to head for higher ground. In advance of a rare landfall near the city of 23 million people expected on Saturday morning local time, China has begun to hunker down. Xinhua reports 220,000 people have been evacuated in Zhejiang province, just south of Shanghai, where Chan-hom’s landfall and worst conditions are expected. Trains, flights, and shipping routes have all been suspended in one of the world’s most active economic zones. Chan-hom briefly reached “super typhoon” status on Friday, with sustained winds exceeding 140 mph, but has since begun a weakening trend as it has moved over cooler water closer to shore. The latest weather models are also showing a last-minute bend to the right in Chan-hom’s expected track, as well as a broadening of the storm’s area of strongest winds, which further complicates the outlook for Shanghai. Still, Chan-hom remains an unusually large typhoon—with cloud cover roughly the size of Alaska. The larger a storm like this is, the more water it can push ashore, boosting the risk of a dangerous storm surge. The latest coastal inundation models show Chan-hom’s storm surge could exceed 20 feet around Shanghai, dangerously close to the 22.6-foot height of the city’s downtown seawall barrier, which is supposed to be able to protect against a 1-in-1,000-year flood. This storm surge will pile up throughout the Yellow Sea, from China to the Korean Peninsula. Since the Yellow Sea is shallow and enclosed on three sides, the potential exists for some of the highest water levels ever recorded along portions of the coast south of Shanghai. Chan-hom’s landfall will also be poorly timed—with its closest approach to Shanghai coming right around the time of high tide, potentially producing an all-time record-level storm surge in the city. Depending on the exact track the storm’s center takes, Chan-hom could end up producing catastrophic flooding in low-lying Shanghai—or not. Shanghai sits in a vulnerable location at the mouth of the Yangtze River, and typically ranks high on lists of cities most at risk of sea level rise. Over the next 50 years, if current projections hold, nearly a quarter of its residents and $1.7 trillion in assets will be underwater. In addition to rising seas, Shanghai’s land is also sinking under the weight of new urban infrastructure and excessive groundwater pumping—accelerating the sea’s yearly advance. Other meteorologists I consulted said Chan-hom’s latest expected track—while keeping the worst winds just offshore—may actually worsen coastal flooding by piling up extra water in the Yangtze. But it’s not all bad news. Masters also notes that Chan-hom’s heavy rains will actually be welcome over the weekend in North Korea, which is experiencing its worst drought in a century. Mesmerizing views of Chan-hom—as well as the smaller but even stronger Typhoon Nangka, which could make landfall in Japan next week—are being provided by Japan’s new ultra-high-resolution Himawari-8 weather satellite, tucked safely 22,000 miles above Earth. Typhoon Chan-hom (left) and Typhoon Nangka (right) inch toward landfall, as seen on Friday. A close-up of Typhoon Chan-hom, as the sun was setting on Friday evening.